Our blog discusses specific baby products available in Australia, as well as design tips for your nursery and any other news relating to baby furniture and nursery design or products. We also discuss safety features to look out for on your cot, high chair, pram, etc and highlight any product recalls you should be aware of. 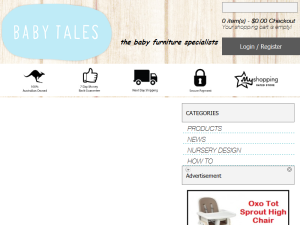 This what your Baby Furniture & Nursery Design Blog Ad will look like to visitors! Of course you will want to use keywords and ad targeting to get the most out of your ad campaign! So purchase an ad space today before there all gone! If you are the owner of Baby Furniture & Nursery Design, or someone who enjoys this blog why not upgrade it to a Featured Listing or Permanent Listing?